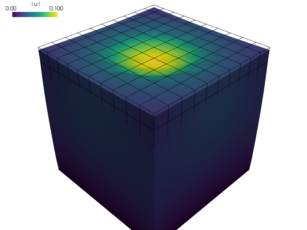 Elastic contact sphere simulating an indentation test. Even though the material is linear elastic and small deformations are used, the problem is highly nonlinear due to contacts with the sphere. See also elastic_contact_planes.py example. k = 1e5 # Elastic sphere stiffness for positive penetration. f0 = 1e-2 # Force at zero penetration.